From Zen Monkey Studios. Originally the primary enemy of Team Avatar, Zuko devoted three years to trying to capture Aang to end his banishment and regain his honor as Crown Prince of the Fire Nation. But then he realized he was on the wrong side of history and became one of Aang's closest friends and advisors! 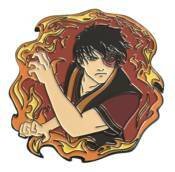 Wear Prince Zuko with a wave of flames surrounding him, in the middle of his firebending action! This soft enamel pin measures an estimated 1.75 inches in height.